This is pretty cool – a chair created on a CNC machine using kerfing as the technique to give it shape. Opens one’s eyes to all sorts of possibilities. Having a decent workbench really does inspire one to take projects around the home to another level. 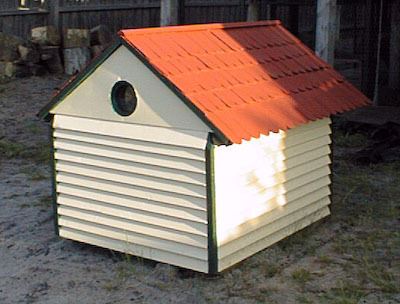 Having a couple of furry friends join the family required some additional accommodation to be built. Rather than being content with just knocking something together, I decided to use the capabilities of the Triton Workbench to make something special. When the puppies were very young, I felt guilty having them outside, particularly with the range of temperatures in Melbourne. 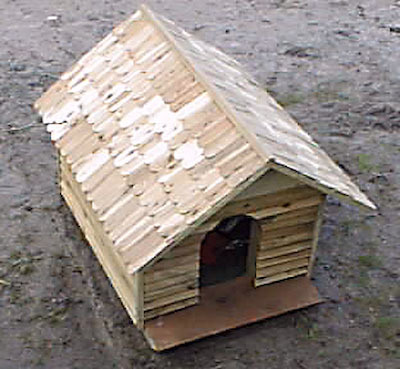 With that in mind, I decided the dog house needed insulation! 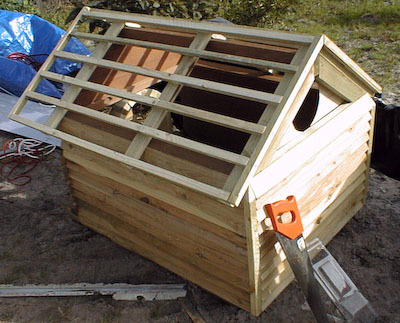 Photo 1 shows the basic treated pine frame, sitting on a base made of treated pine and external grade plywood. 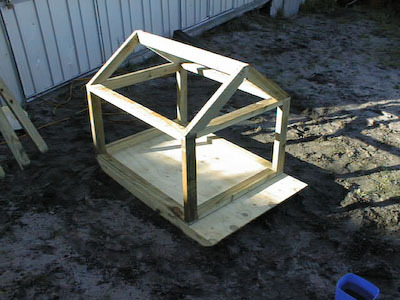 The base sits on 4 castors, so the dog house can be moved relatively easily, despite its weight. Part of the reason for the heavy structure was so there would be room between the inner skin and the ‘weatherboards’ for some fibreglass insulation. The door was similar, made with an arch rather than just a rectangular entrance. The insulation was pushed into place, and held there with the weatherboards. It was about this stage that I wished that I had bought the GMC nailgun! (I have since added this to my tool collection) To stop splitting of the weatherboards, each nail hole had to be pre-drilled. It was a big job, but the result looks great! The weatherboards around the doorway were shaped to the curve of the archway with a handheld jigsaw. It was then time to manufacture the roof. Like everything else, I didn’t want to take the easy option. Some more Cyprus pine uprights were split into three on the Workcentre, ready to be made into roof shingles. The sub-frame can been seen in Photo 4 temporarily fitted to confirm it will fit correctly. The roof is quite a layered affair. 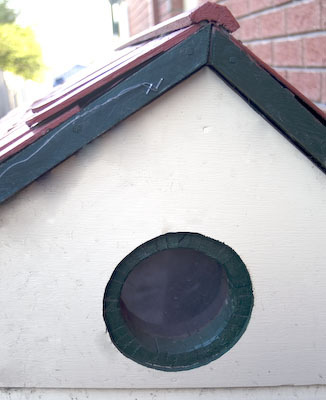 From the inside to out, there is a layer of plywood, then fiberglass insulation. On top of that is the roof sub-frame, then black PVC sheeting is layered on that to ensure the roof doesn’t leak. Any water that gets through the top layer (the shingles) will run down the PVC and drain to the outside. The roof overhangs the walls, and the doorway both for heavy weather, and for asthetics. The shingles were made on the Triton Jigsaw Table, with the front of each shingle rounded (again for asthetics). These were attached to the roof frame from bottom to top, overlapping each row so rain runs off. showing the arch doorway and roof shingles. 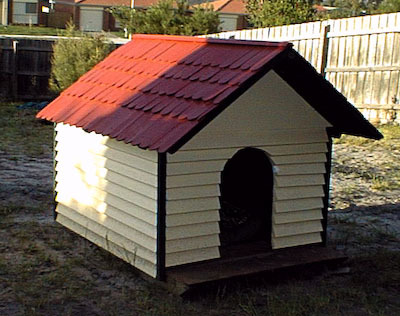 I am assured that the doghouse meets the expectations of the new occupants! However, it turns out they also want a wine cellar, and have spent considerable effort digging one for themselves! That’s fine- so long as they don’t expect me to stock it. When working with wood, it is very common to start off only really thinking every joint must be 90 degrees and each member must be either horizontal or vertical. After a while, as experience builds, you start to venture into having (shock horror) some items at 45 degrees, and all the extra problems this causes! It doesn’t have to be that way! If you have a tablesaw, or a SCMS (Sliding Compound Mitre Saw), there is another way you can include curves in your project. Think of a Dress Mirror with a curved top, a round box, or…well let your imagination run. 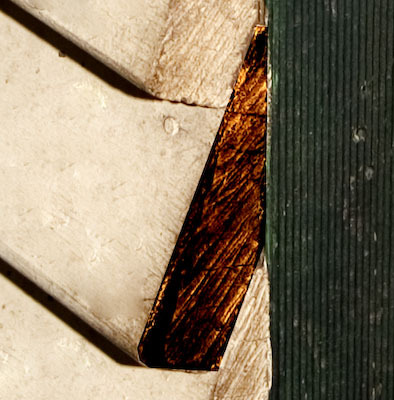 Did you know that every guitar is full of kerfing, reinforcing the interior corners? So what really is kerfing? Kerfing is in simple terms the act of cutting a series of kerfs (cuts) in a piece of wood in close proximity, so the wood can be curved. It is important not to make the cuts too deep, resulting in the wood cracking completely through, or not deep enough so instead of bending, it snaps (and therefore weakens the wood…….). 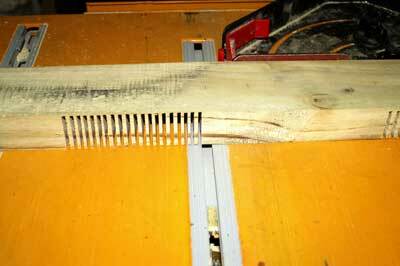 The wood needs to be cut to the point that the remaining fibres are free to bend. 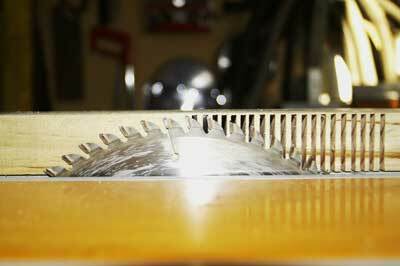 You can only kerf by crosscutting- you cannot kerf with the grain as the likelyhood of the workpiece splitting is huge. 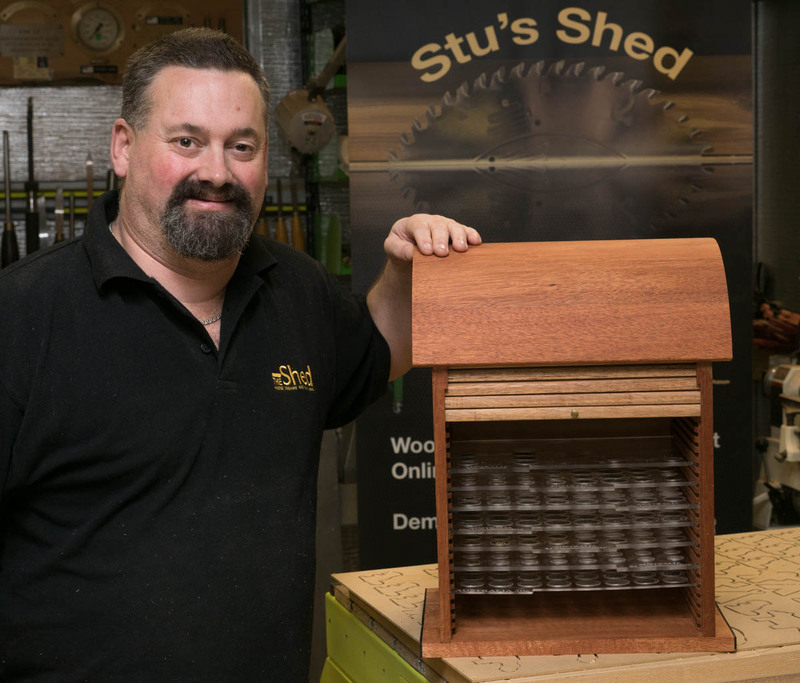 This doesn’t have to be solid stock either – you can kerf whole sheets and bend entire panels. Photo 1 shows a series of kerfs cut, and the depth of cut. I did try a slightly shallower cut, but the wood snapped when I bent it. It just goes to show that test cuts are imperative with this technique. It is very dependent on the type of wood, the moisture content, the relative humidity, the width of the blade, which way you hold your tongue…..
To fix the kerfing, I tend to use lots of glue! You can fill it, and if you want to disguise the kerfing, either mix sawdust in with the glue (well, so I’ve heard, but when I tried it, it looked pretty crap), or use an appropriate wood filler. Of course, you can also accentuate the effect by using a contrasting wood filler. It is a great technique, and is worth persevering with until you get one that is successful. If you are getting consistent failures, the chances are you are being too conservative on the depth of cut, and the outside of the curve is resisting the bend and fracturing. 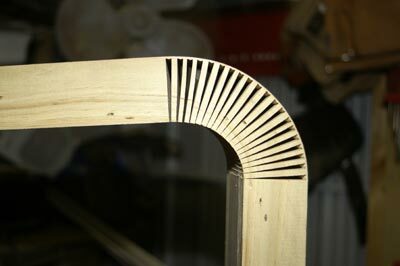 Whatever you do, don’t bend the kerf the other way (with the fins on the outside). Not that the wood doesn’t bend that way, but it looks pretty silly, and makes for an incredibly weak curve. Bent in, the spines all end up impacting on each other, and therefore support each other. They also give you something to glue together. A kerfed curve is never going to be a structural member, but where absolute strength is not required and the curve is important for aesthetics, then this technique may be worth considering. Please note, comments have now been disabled on this post due to the amount of spam it was receiving.